September 13, 2010 - The landmark case of Major Margaret Witt, a decorated U.S. Air Force flight nurse dismissed under the "Don't Ask, Don't Tell" policy, goes to trial today in U.S. District Court in Tacoma. The ACLU of Washington is representing Maj. Witt in challenging her discharge. The trial is expected to last seven days. "I want to serve my country. I have loved being in the military – my fellow airmen have been my family. 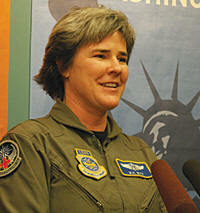 I am proud of my career and want to continue doing my job," said Maj. Witt. "Wounded people never asked me about my sexual orientation. They were just glad to see me there." In 2008, the U.S. Court of Appeals for the Ninth Circuit ruled that the Air Force must prove that discharging Maj. Witt was necessary for purposes of military readiness. While the ruling left in place the military's "Don't Ask, Don't Tell" policy, the court found that before discharging a soldier, the military must prove that the individual's conduct hurt morale and unit cohesion. The case was remanded to federal district court for trial under the appellate court's standard of review. "Maj. Witt has been an exemplary member of the military with a distinguished record of service. To discharge her simply because of her sexual orientation is unfair to her and also is unwise for the military, which needs her skills," said ACLU of Washington Executive Director Kathleen Taylor. Maj. Witt's trial will proceed as scheduled despite a recent ruling by a federal district court in a separate case that struck down the "Don't Ask, Don't Tell" policy as unconstitutional. That ruling should be persuasive authority here, but is not yet binding on the federal court in Tacoma. "Maj. Witt's case illustrates once again the baseless nature of the 'Don't Ask, Don't Tell' policy," said James Esseks, Director of the ACLU Lesbian, Gay, Bisexual and Transgender Project. "The policy is founded on the idea that openly lesbian or gay service members will detract from morale, but the evidence here shows that Maj. Witt's colleagues didn't care that she's a lesbian. Congress should not wait for more courts to rule, it should finish the job and repeal this law." Maj. Witt was a flight nurse assigned to McChord Air Force Base near Tacoma. During her 19-year career in the Air Force, she served in the Persian Gulf, received many medals and commendations and always had superb evaluations from her superiors. In 1993, she was selected to be the "poster child" for the Air Force Nurse Corps recruitment flyer. Maj. Witt served in Oman during Operation Enduring Freedom and received a medal from President Bush, who noted that she had delivered "outstanding medical care" to injured service members and that her "outstanding aerial accomplishments…reflect great credit upon herself and the United States Air Force." In 2003, Maj. Witt received another medal for saving the life of a Defense Department employee who collapsed aboard a government chartered flight from Bahrain. From 1997 to 2003, Maj. Witt was in a committed relationship with a civilian woman. In the summer of 2004, Maj. Witt was notified that the Air Force had begun an investigation into an allegation that she had engaged in homosexual conduct. In November 2004, she was placed on unpaid leave and told she could no longer participate in any military duties, pending formal separation proceedings. In March 2006, the Air Force informed her that she was being administratively discharged on grounds of homosexual conduct. The military has provided no evidence that her sexual orientation or conduct has caused a problem in the performance of her military duties. To the contrary, the ACLU has submitted declarations from military colleagues testifying that her forced absence is harmful to her unit's morale. Representing Maj. Witt are ACLU-WA Legal Director Sarah Dunne and Sher Kung, a Perkins Coie Fellow, and ACLU-WA cooperating attorneys James Lobsenz of Carney Badley Spellman and Aaron Caplan of Loyola Law School.